Brain Facts is part of the I Am Your Child public engagement campaign. Like all of the Campaign’s activities, its aim is to raise public awareness about the importance of the first three years of life. Brain Facts suggests how recent findings by scientists affect you and your children. It puts these findings into a broader context and addresses some of the questions you may have about your child’s early development. Q: Why are we hearing so much about children’s brains these days? A: How we humans think and learn–and how we gain these capacities–has always fascinated people. But recently these questions have inspired even greater interest and attention. There is a good reason for new interest in the brain. Thanks to new technologies, including powerful brain scans, scientists are now able to form a much clearer picture of the brain’s inner workings. These technologies have allowed new insights into early development. But technological breakthroughs are only part of the story. New interest in the brain also reflects growing concern across the nation about young children’s learning and overall well-being. In particular, parents are eager to understand the role they play and how they can enhance their children’s brain development in the crucial early years. Q: What have scientists discovered that we didn’t know before? A: Scientists have made many discoveries about how a child’s earliest experiences affect the way the brain is organized. Some of the neuroscientists’ findings simply confirm what many parents already suspected. For example, researchers now confirm that the way you interact with your child in the early years and the experiences you provide or encourage have a big impact on his emotional development, learning abilities and how he functions in later life. At the same time, scientists are now learning much more about the biological processes that underlie what we have known. Q: Exactly how do parents affect brain development? A: The human body is entirely made up of cells, and the brain is no exception. 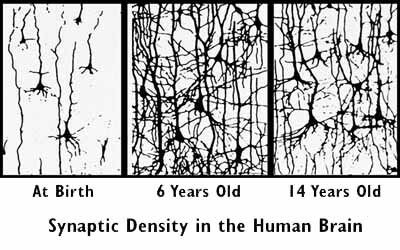 Before birth, a baby’s brain cells multiply at an astonishing rate. By the time your baby is born, she will have 100 billion brain cells. These cells are not yet connected in networks as they will be when her brain is mature. The networks formed by brain cells are crucial. Among other things, they allow thinking and learning to take place. Given the importance of these networks, why do babies begin life without them? One answer is an unfinished brain offers an important benefit to your baby. It lets him form networks of brain cells in direct response to the world — and from an infant’s viewpoint, you are the world. Babies experience the way you look into their eyes, and they see the expressions on your face; they hear you cooing, singing, talking and reading; they feel you holding or rocking them; they take in your familiar smells; they often experience the taste of your skin as well as their own. Touch is especially important: holding and stroking an infant stimulates the brain to release important hormones that allow him to grow. Your love for your child is, of course, the key to the powerful connection between the two of you. But it is the expression of your love that affects the way her brain forms connections. Q: How do brains form connections? A: Fortunately, brain cells are perfectly designed for making connections. Each cell sends signals out to other brain cells and receives input from other cells. The signals, in the form of electrical impulses, travel down the length of the nerve cell. With the help of special chemicals (such as serotonin), they travel from cell to cell, creating connections. Repeated activation of networks of neurons strengthens these connections. These connections are miracles of the human body. But to understand their power, you have to multiply this miracle by trillions. A single cell can connect with as many as 15,000 other cells. The incredibly complex network of connections that results is often referred to as the brain’s “wiring” or “circuitry.” Experience shapes the way circuits are made in the brain. Q: How does the brain “know” which connections to keep? A: This is where early experience comes into play. When a connection is used repeatedly in the early years, it becomes permanent. In contrast, a connection that is not used at all, or often enough, is unlikely to survive. For example, a child who is rarely spoken to or read to in the early years may have difficulty mastering language skills later on. By the same token, a child who is rarely played with may have difficulty with social adjustment as she grows. Q: Does it matter when connections are formed? A: No complex construction process can happen all at once. Different parts of the job get top priority at different times. It’s the same for brain development. During certain days early in pregnancy, the cells that will make up the cortex–the part of the brain that allows thinking–have to travel to exactly the right place at the right time. This is a “prime time” for brain development. Of course, it is always risky for an expectant mother to take drugs or come into contact with radiation. But during this prime time, it is especially dangerous. If cells get sidetracked in their journey up the cortex wall, the baby’s brain development may be jeopardized. There are other prime times both before and after birth. Some of them are relatively short. For example, if the brain is not exposed to visual experiences in the first years of life, a child will not be able to see. Other prime times last a decade or more. For example, for the first dozen years of life, children can learn languages very easily, as opposed to later in life. Whenever these prime times are discussed, it is essential to keep in mind that it is never too late to help a child learn and develop–although it can be more costly and time-consuming than in the early years of life. Q: What does this mean about my relationship with my child? A: Scientists have found that your relationship with your child affects his brain in many ways. By providing warm, responsive care, you strengthen the biological systems that help him handle his emotions. Research also shows that a strong, secure connection with your child helps him withstand the ordinary stresses of daily life–not just today, but in the future as well. A strong bond doesn’t just reassure him, it actually affects the biological systems that adapt to stress. Scientists have shown that in stressful situations, children who have experienced a secure attachment to a parent are more adaptive and produce less cortisol, a stress hormone which affects metabolism, the immune system and the brain. Excessively high levels of cortisol alter the brain by making it vulnerable to processes that destroy brain cells, and just as importantly, by reducing the number of connections in certain parts of the brain. Q: How can I ensure my child’s healthy development when I’m at work? A: Brain development is non-stop. It continues around the clock–not only during the hours that you spend with your children, but also during the times when you are away. That’s one reason why high quality child care is so important–whether the caregiver is a relative, neighbor or child care provider. The person responsible for taking care of your child while you’re at work is helping to shape the experiences which allow the brain to develop. From the child’s perspective, every important caregiver is a potential source of love and learning, comfort and stimulation. Children need experiences with important caregivers who are sensitive to their emotional and physical needs. By providing consistent and responsive caregiving, you can ensure that your child will have the best opportunity for healthy emotional and social development. Every important caregiver has the potential to help shape a young child’s future.